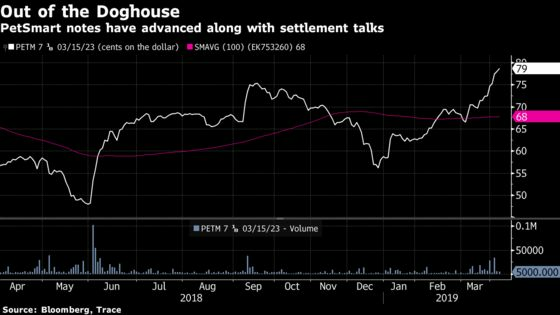 (Bloomberg) -- Investment giant Capital Research and Management Co. wants to take over a lawsuit against PetSmart Inc. that other creditors dropped after settling their dispute over the retailer’s Chewy.com online business. CapRe, which holds more than $80 million in PetSmart term loans and $600 million of its bonds, is seeking status as a new plaintiff, according to papers filed Thursday in a Manhattan federal court. The motion came just a day after PetSmart won approval from more than half of its lenders to retroactively support a 2018 transfer of Chewy shares to separate entities. Some creditors had contended the transfer unfairly stripped them of claims on Chewy’s assets. CapRe reasserted that view in its filing, and said PetSmart’s asset shuffling amounted to a default and an illegal dividend. “CapRe questions the manner in which these consents were obtained, and submits that the amendment cannot extinguish CapRe’s rights, as an individual term loan lender, to challenge the transactions,” the firm said in its court filing. Representatives for PetSmart and for Capital Research didn’t immediately respond to requests for comment. PetSmart became entangled in a dispute between its lenders and its private equity owners -- a group led by BC Partners -- after it moved a portion of shares in the Chewy.com unit to parent company Argos Holdings and another stake in the online retailer to an unrestricted subsidiary. Lenders argued that PetSmart was insolvent at the time of the transfer, and that the move was thus fraudulent. CapRe repeated the accusation in its filing, and questioned how PetSmart concluded it had majority support from its lenders. “The process by which such purported consents were ostensibly obtained, however, and the manner in which they were counted by PetSmart, is shrouded in secrecy and confusion,” according to CapRe’s filing, which was submitted by lawyers at Quinn Emanuel Urquhart & Sullivan. Attorneys at the law firm declined to comment. The filing pits Phoenix-based PetSmart against a formidable foe. Los Angeles-based CapRe is the adviser to an array of portfolios including the American Funds family of mutual funds, and had almost $2 trillion in discretionary assets under management as of mid-year 2018. PetSmart, the pet-supply superstore, has struggled financially and bought Chewy in 2017 to spur growth. It has pegged the value of the unit at $4.45 billion, excluding cash on the balance sheet, and CapRe said Chewy accounted for most of PetSmart’s sales growth just before the transfer was announced. The company’s initial effort to amend its loan agreement met resistance from creditors. But a revised offer attracted participation from creditors including one of the largest, Apollo Global Management, people with knowledge of the matter said earlier this week. By the end of the day, PetSmart counted support from enough holders on board to push the amendment through. Even if that’s correct, CapRe said it still should be permitted to intervene because it’s also one of PetSmart’s largest noteholders, and the transfer violated those indentures as well as the loan agreement. While the motion was filed on behalf of CapRe, other bondholders and term loan holders are considering similar actions, according to people with knowledge of the matter, who asked for anonymity to discuss private deliberations.